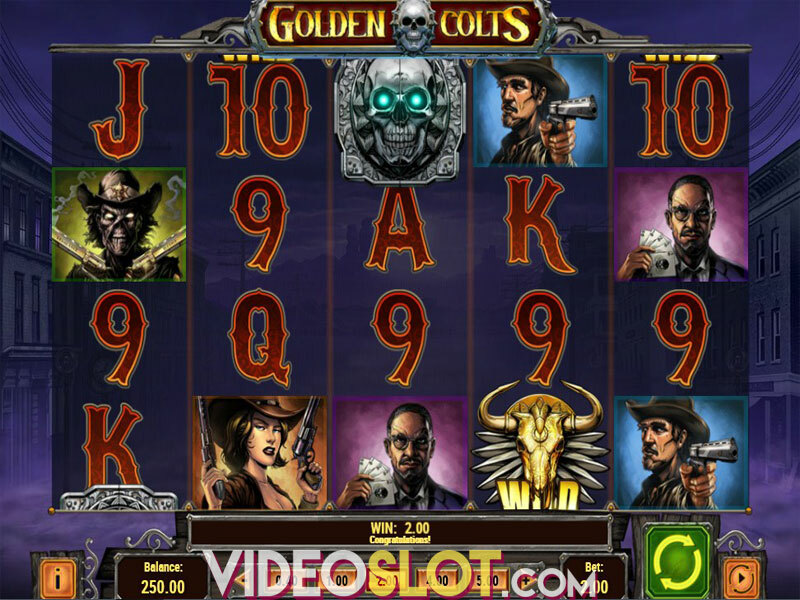 Team up with a gang of lucky gamblers and skilled shooters with the Wild West-themed video slot Golden Colts. If you prefer action packed games teeming with bonus features and special symbols, then the exciting release powered by Play’n Go is sure to be right up your alley. The 5-reel, 40-payline slot benefits from even seven bonus features including free spins, Mega Symbols, up to 30x multipliers, Wild reels, 2x2 symbols enhanced with sticky Wilds and re-spins, as well as a pick-me game, which can help you grab up to 2,500x your bet on a single spin! Before you embark on the adrenaline-fueled adventure, we would advise you to select your bet ranging from $0.20 up to a ceiling of $100 per spin. The high-paying symbols are represented by four gang members – a gunslinger, zombie sheriff, gun-toting girl and a gambler. The playing card symbols from 9s through As constitute the low-value symbols on the reel set. Finally, Wilds come in the form of a golden buffalo skull and they can substitute for all other icons apart from silver skull Scatters. Land three silver skull Scatters anywhere on the reels and activate the Golden Colts Bonus Game. Here, a gun barrel will spin thus revealing 1 of 7 bonus features such as Ace-High Gang during which 3 free spins will be awarded, along with large 4x4 symbols that can pop up on the reels 2 to 5. Wild Bull will provide 3 free spins, with one or two reels turned completely wild, whereas Law of the Wild will give you 1 free spin paired with zombie sheriff symbols that can appear stacked on the reels 2, 3 and 4. Keep in mind that if the sheriffs cover all 3 reels, an additional free spin will be awarded. Gunslingers will grant 1 free spin enhanced with up to 30x multipliers for your wins, while Poker Play will award 1 free spin with a 2x2 gambler. Additionally, should the second gambler land, you will win an extra free spin. Furies will award 1 free spin along with 2x2 female shooters on the reel set. Re-spins will be awarded until you get a winning spin. Most Wanted is a pick-me game where you choose from 20 'Most Wanted' posters revealing various cash prizes or another pick, but be cautious since any of them that does not belong to the 'most wanted' group will finish the game. Golden Colts is a medium-variance offering with an RTP of 96,55% and the highest potential win of 2,500x your bet. Being packed with a number of bonus features, the game promises lots of action, as well as some lucrative rewards, thanks to a 30x multiplier. However, we must admit that the bonus game requires some patience and is a bit hard to trigger. Where to Play Golden Colts?